EUGENE, Ore. – In the latest cutting-edge facility to open at the University of Oregon, science and sport converge to put student-athlete wellness first. 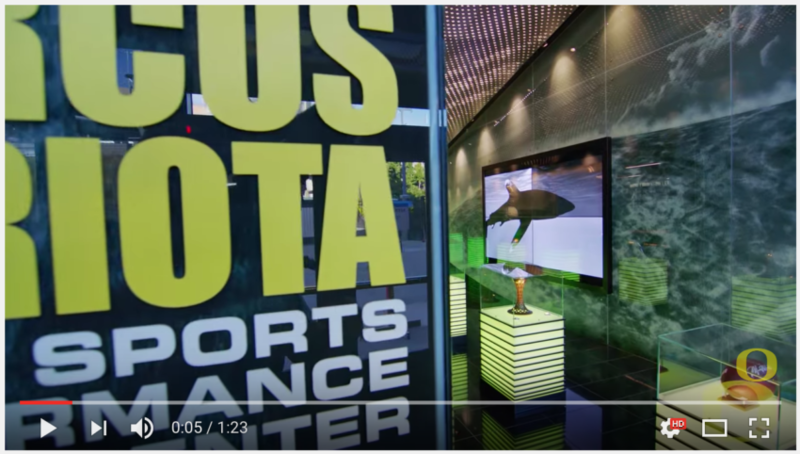 In uniquely Oregon style, the recently opened Marcus Mariota Sports Performance Center combines sports performance, sports science, sports medicine and technology in one efficiently designed space on the ground floor of the Casanova Center. Another part of the project, the overhaul of the equipment room, is a testament to style and function. Entering from the west, student-athletes walk into a trophy lobby that is a stunning tribute to the Sports Performance Center’s namesake. Trophies for the Walter Camp Player of the Year, Johnny Unitas Golden Arm Award, Davey O’Brien Award, Maxwell Award and Manning Award reside in the lobby. One wall has a remarkable transparent LED flat screen television that alternately shows highlights of Marcus Mariota, and then reveals a shadowbox with memorabilia of his from Hawaii. There is also a playful illustration of a Pacific Ocean scene, complete with the Duck on a surfboard. This inspiring entrance leads to the junction under a new skylight at the heart of the MMSPC, where innovations and applied science truly become the focus for Oregon’s student-athletes. Remarkable technology and efficiency of space in the 30,000 square-foot renovation are two of the most impressive byproducts of the MMSPC construction. “The goal of this project was to create one space where we could utilize the most state-of-the-art technology to improve student-athlete wellness and emphasize our commitment to the health and safety of our student-athletes,” said Oregon athletic director Rob Mullens. “Thanks to the incredible generosity of Phil and Penny Knight, we now have a world-class facility that is going to take the student-athlete experience at the University of Oregon to a level not previously seen anywhere on the collegiate level.”From that central hub off the trophy lobby, student-athletes will be just steps away from the new sport science and equipment areas, as well as the preexisting sports medicine facility and weight room. “We focused on creating a space that would allow us to objectively measure a student-athlete’s development and readiness,” said UO director of athletic medicine Dr. Greg Skaggs, who was a part of two fact-finding trips to research the MMSPC construction, including one that took him to NASA as well as Australia. “This data will give us the best opportunity to individualize training to maximize performance and prevent injury. “Unlike other university performance centers, this facility is designed to make real-time interventions into a student-athlete’s training program and well-being,” said Skaggs. The sports science unit of the MMSPC contains a number of areas where the technology of the new facility truly shines. Motion capture cameras and force plates are located throughout the space. The cameras are used to capture a subject while performing virtually any movement, ranging from sport specific drills to more traditional weightlifting. Utilizing force plates, the MMSPC staff can perform strength diagnostic tests to profile and identify areas of opportunities for each student-athlete. There are three main components to the sports science unit, recovery, physiology and movement. The recovery area is a multipurpose space, with a gray Mondo floor inlayed with Oregon’s well-known feather pattern, that focuses on recovery following a game or practice, be that via stretching or foam rolling. In addition, baseline measurements will be taken via a marker-less motion capture system to identify any deviations from a subject’s normal range, which can help identify where intervention needs to occur prior to injury. The physiology area is the most eye-catching with a small boxing ring for shadow boxing, complete with overhead ring lighting in the shape of a glowing yellow “O.” It is important to note that no sparring is allowed in the boxing ring; it is for exercise purposes only. The area also features heavy punch bags, speed bags, exercise bikes, antigravity treadmills and strength diagnostic areas in the form of instrumented platforms. The physiology area also contains a bone density scanner and an examination room, as well as a neurocognitive center, which in part will help diagnose and treat concussion symptoms. The movement area has an open space with 16 motion capture cameras mounted in a square around the 19-foot ceiling. It is also equipped to accommodate mobile tripod-based motion capture cameras. There is also a 40-yard running track, which has its own set of motion capture cameras and force plates. Perhaps the most critical component of the entire sports science area is that all of the information captured by the cameras and force plates will be fed into a computerized athlete management system that will provide data and feedback to staff and student-athletes on their progress. Using touchscreen technology located throughout the MMSPC, student-athletes will be able to track their workouts and see their results in real time. Also located within the sports science space is a passive recovery area, where athletes can rest on recovery tables and utilize the popular pneumatic compression units, which assist the body’s circulation in order to speed recovery and decrease muscle soreness following a competition or practice. The most unique room in the sports science area is a small, warmly lit room with five sleep pods where student-athletes can come and rest in between practices or meetings. Recent studies involving members of the athletic department have highlighted the crucial role that sleep plays in performance. The Ducks’ rebuilt equipment room utilizes space in a way not previously done in college athletics, while at the same time providing visual fireworks that will catch the eye of student-athletes and fans alike. The ingenious helmet wall, located in a room called the Armory, has the ability to display numerous helmets worn by the UO football team. But the hidden treasure is that the wall opens up into shelving that has room to store several hundred helmets, as well as facemasks and other parts. The Armory is also a helmet construction workshop with overhead pneumatic drills and easily accessible components, meaning a NASCAR-like repair or rebuild of a helmet is now possible. Overall, the new equipment room has 2.5 miles of shelving, and makes the most of the area’s 19-foot ceilings through the use of a customized shelving system built by Spacesaver Specialists, Inc. The 16-foot shelves that slide on a system of rails are the tallest, most distinctive customized system Spacesaver Specialists, Inc. has ever built for an athletic equipment room. The new equipment room not only houses football gear, but also baseball, lacrosse, soccer and acrobatics and tumbling. There are also lift systems for the storage of the equipment room’s laundry baskets, as well as for the trunks that the equipment staff pack for each road football game. The laundry facility, called the Pond, has also been upgraded to allow equipment staff to complete up to 500 pounds of laundry at once. The sizzle of the equipment room is a display area that features a wall of shoes, gloves and uniforms. Student-athletes can step into a sunken alcove where a one-of-kind mirror will digitally display their likeness in a variety of Oregon uniforms. Down the hall in the Haberdashery, there is an oversized armchair, complete with web foot legs – an Oregon spin on the traditional claw foot legs – with “fighting Ducks” attached to the ends of the arms, where student-athletes can test out the latest footwear offerings from the equipment room. “Our hope was to recreate a Niketown-like atmosphere, with bright lighting and a lot of energy to showcase all of the unique features of our uniforms and other equipment,” Wasson said. As with the Hatfield-Dowlin Complex, DAF donors and season ticket holders will have access to tours in the future. Tagged Craig Pintens. Bookmark the permalink. When the AD PR employee writes “The most unique room…” we are again reminded that the AD has precious little to do with education. Impressive. Gotta admit athletics knows how to publicize things. Perhaps the replacement building for PLC will get a similar glowing writeup and youtube video. The inspiring PLC entrance boasts a number of doors to choose from. These are double doors made of state-of-the-art glass, occasionally cleaned, with highly visible directions for pushing or pulling. The lobby of this structurally sound building is inlayed in Oregon’s well-known beige tile with scuff mark accents. It is polished to a murky glow at least twice a year. One visible feature of the lobby is the bulletin boards, which showcase innovative efficiency of space. There is nary a square inch that isn’t covered in flyers, some of which promote events that haven’t yet happened. PLC elevators are a testament to style and function. With playful lurches, visitors can ride all the way to the eighth floor, stopping along the way to admire the stunning view of long hallways with windows at each end. Professors with offices in PLC marvel at their efficiency of space, which makes it easy for them to reach everything in their office without ever standing up. Each office features a computer of some sort, where professors can type their research and track their progress in real time on the screen. The sizzle of a faculty office is seldom realized until midsummer, when PLC becomes a hidden treasure of a sauna. The warmth of PLC on a summer day also transforms PLC offices into passive recovery areas, and, in some cases, sleeping pods where professors can rest between classes and meetings. Recent studies involving members of the athletic department have highlighted the crucial role that sleep plays in performance. Comment of the week. Please contact our swag office for your complimentary UO Matters coffee cup.